We all experience fatigue sometimes – when we are tired, lacking energy, and feeling weak. Generally this goes away after a nap or a good night's sleep. But fatigue is a common side effect of several conditions. It is common for people who have had cancer treatment, or who have persistent pain. It can last for months, or even years. In these instances, resting doesn't make it go away. 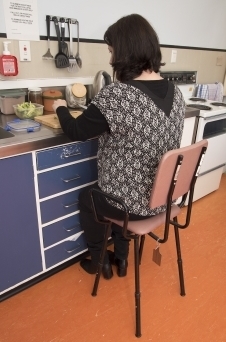 A perching stool is one piece of equipment that can help you manage this, so you can still do your day-to-day tasks. Perching stools are high stools with a seat that slopes down at the front. You can use them in the kitchen and bathroom to do things that you would otherwise have to stand a long time for. You can use perching stools with or without arms or back rests. They can carry anyone up to 113 kg. You will need to adjust the height to suit your height and what you need to use it for. Find the row of holes on each leg. There will be a small button in one of the holes. Push the button in and slide the lower leg section up or down until it is the height you need. Make sure the button pops out of the hole again. This locks it into position. Sit on the seat and make sure it is at a comfortable height when your feet are firmly on the floor. South Canterbury DHB, Perching stools. Authorised by M Parish, SM, R Templeton, DOAH. February 2016.